FORT DRUM, New York (May 3, 2018)–Captain Luke Reese, commander of C Company, 7th Brigade Engineer Battalion, 1st Brigade Combat Team, 10th Mountain Division (LI), successfully transmitted a 300-mile high frequency voice and data radio check to West Point while spearheading a new program to boost tactical communications from Fort Drum. Maj. Gen. John Baker, Commanding General, U.S. Army Network Enterprise Technology Command, observed the radio check from West Point. In an effort to renew some looked-over radio options, Reese opened the possibility of HF long-range capabilities. Leveraging high frequency is a skill that hasn’t been prioritized in the Army in recent years. The Army uses frequency modulation and ultra-high frequency tactical satellite, which have benefits, but are also limited. Reece’s efforts in HF strives to enhance the Army’s ability to maintain mission command while extending the brigade’s, or any unit’s, operational reach. Click here to read at DVIDS. This entry was posted in Ham Radio, News, Shortwave Radio and tagged DVIDS, Kim Elliott, Military Communications, Why Shortwave on May 11, 2018 by Thomas. Commander, Task Force (CTF) 75 successfully completed communications systems tests using high-frequency (HF) radio waves to broadcast voice and data 6,050 miles from Naval Base Guam to Port Hueneme, California, July 27, 2017. 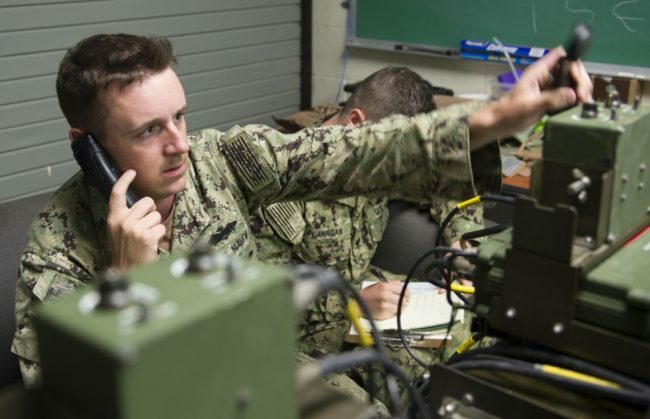 The assessment tested the capabilities of expeditionary forces to use HF waves to deliver data over the Pacific. HF has become a viable alternative for military forces when more common forms of communication, such as satellites, are unavailable. Utilizing the assets of CTF-75’s Naval Mobile Construction Battalion (NMCB) 1, the command configured its antennae to broadcast to California. Once a successful voice transmission was received, communication directors at Navy Expeditionary Combat Command Pacific requested that CTF-75 try to send a data file. Common communication devices used by the U.S. military incorporate satellites. CTF-75 has been testing HF systems in the case of satellite communication failure. HF is a frequency wave broadcast that is transmitted around the curvature of the Earth. Unlike other forms of frequencies, such as very-high frequencies and ultra-high frequencies, the transmission is not distorted by terrain or physical obstructions. “We may not always have access to operational equipment or the latest assets, but as communicators we should have a backup plan that is ready to be executed,” said Carmon. Guam is located in the western region of the Pacific. Having an HF range of 6,000 miles is equivalent to broadcasting from Japan to the U.S., or oppositely, from Japan to the middle of Africa. During this most recent test, CTF-75 was also able to establish communications with Mobile Diving and Salvage Unit 1 in Hawaii. CTF-75 is currently testing its communication abilities with subordinate commands which include Seabee units, riverine squadrons, cargo handlers, explosive ordnance disposal technicians, and expeditionary intelligence forces. CTF-75 is the primary expeditionary task force responsible for the planning and execution of coastal riverine operations, explosive ordnance disposal, diving engineering and underwater construction in the U.S. 7th fleet area of operations. This entry was posted in Articles, News, Shortwave Radio and tagged DVIDS, Military, Military Communications, Military Radio, Why Shortwave on August 8, 2017 by Thomas.